User Interfaces act as the interaction layer between human and computer and have an important role in system adoption. According to technology acceptance model, acceptance of a system is explained as a function of perceived usefulness and perceived ease of use. Since there are several external variables that have an impact on those variables, the content and interface design of every single application should be addressed specifically to enhance users’ intention to use the system. Adding adaptive features into systems may be one of the approaches to address this phenomenon. This paper identifies external variables including adaptive behavior impacting acceptance of a mobile reservation system through implementation of two prototypes. Research has several streams related to our objectives. There is a significant amount of work done specifically in the adoption of information systems. There is a growing amount of work focusing on mobile services and finally equal amount of work focusing on adaptivity factor. 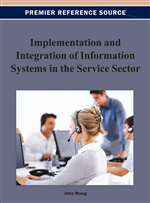 According to prior research, there are several user and service related characteristics that impact users’ intentions to use an information system. Pinhanez (2008) proposed a Service Science framework for online service applications in order to explain and predict the differences between traditional interactive software tools and online service applications. Through the framework, 15 important issues for online service interfaces have been identified. Those issues include trust, privacy, security, consistency and personalization which are the constructs derived from our study. Chalmers (2003) proposed that cognitive factors and concepts should be taken into consideration when developing user interfaces. According to Bederson (2004) interfaces should keep us on the flow by making us concentrate on our work. Wood et al. (2006) mentioned about importance of attention and proposed 8 design issues to consider for developing systems that are aware of user attention. Murrell (1998) explained design principles that should be taken into account for use in a multi lingual, multi cultural environment. Kamppuri, et al. (2006) explored culture-related studies to analyze occurrences and characteristic of culture studies in HCI. Bassam and Mesbah (2007) examined interface style’s impact on user perceptions and behavioral intention for technology acceptance and usage. They found out that interface style has indirect effect on behavioral intention through its direct effects on perceived ease of use (PEOU) and perceived usefulness (PU). Ho (2006) explored motivating and inhibiting factors and their effects in switching from current websites to personalized websites. Kargin et al. (2009) investigated adoption factors in mobile services and figured out that usefulness and ease of use are the most important aspects which can be influenced by service or social aspects that constitute the main determinants of mobile service adoption taxonomy proposed in their paper. Phuangthong and Malisawan (2005) examined factors, the constructs in TAM, which have effects on user adoption of 3G Mobile Internet technologies in mobile learning. Huang and Huang (2005) studied TAM in the women-centric context and have remarked that perceived usefulness is not a contributory factor for the intention to visit a web site in the women-centric context and perceived ease of use is less important when compared to perceived usefulness and perceived playfulness. Through the use of Eye Tracking Study and Scan path analysis methods, Lorigo et al. (2006) analyzed impact of gender and task on users’ search and evaluation behavior. In order to improve interface design by figuring out how users browse search results and select links, Granka et al. (2004) analyzed user behavior in web search through eye-tracking. Dougan and Bronson (2003) reviewed a case study to see the effects of path dependence, network externalities, and impacted information on the adoption of computer reservation systems.